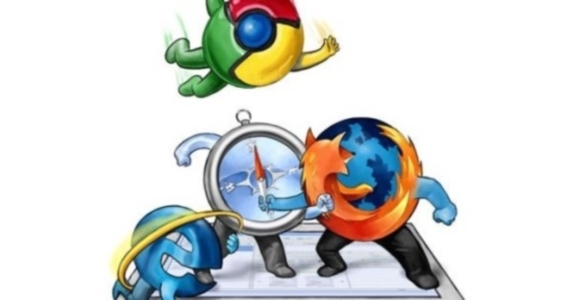 We started last week by looking at the initial browser wars of the mid to late 1990’s which saw Microsoft triumphing over a very prolific company of the time, Netscape.For a long time Netscape enjoyed a huge share of the browser market before Microsoft developed Internet Explorer, gave it away for free and bundled it with their Windows Operating System.Netscape didn’t last long and even to this day the actions of Microsoft are the subject of many debates, not to mention court cases, concerning allegations over restriction of competition and the abuse of a monopoly power. Microsoft, however, got complacent and left a massive gap between releasing Internet Explorer 6 in 2001 and Internet Explorer 7 in 2006.This left a void which allowed more advanced and capable browsers to get a foothold in the market, resulting in a second series of browser wars. Despite Internet Explorer still being an integral part of Windows, products by much smaller companies are currently enjoying a large amount of the market share amongst Internet users.This week we’re going to take a look at some of the alternatives and how they’re facing up to the competition. First released publically in 1996, Opera is certainly one of the more established browsers currently participating in the browser wars.Considered to be possibly one of the most pioneering, Opera has had support for technologies such as tabbed browsing and mouse gestures for years.Unfortunately the browser religiously follows web standards and as such many websites simply don’t display as you would expect them to.Rather unfairly this browser currently holds just an estimated 1% of the browser market and more awareness is needed if Opera is going to become a serious contender.Download Opera free of charge by visiting www.opera.com. This is the browser that most users will be familiar with as it is the one built in to the Windows Operating System.Internet Explorer 6 was a dinosaur and was five years old by the time it was replaced in late 2006 by Internet Explorer 7.The latest version has made up for lost time as it now includes standard modern day features such as tabbed browsing and phishing support.The browser is, in my opinion, extremely bloated so if you have a little time on your hands then download the latest version from www.microsoft.com/ie7/ or by performing a Windows update. I appreciate that I have already stated that Netscape were beaten in the first browser war, however the broken company was purchased at the time by AOL who up until now have done relatively little with the technology and every version of Navigator until now has been lacklustre.The latest version doesn’t break any major milestones in browser development, but it is far superior to its predecessor and has the potential to do well.